BIGFOOT'S BLOG, Late-October--Ooops!--Wait, NO! ...Mid-May 2011 Edition. NOTE: THIS IS AN OLD BLOG POST WE NEVER GOT AROUND TO FINISHING. THE BLUFF CREEK FILM SITE PROJECT STUFF JUST OVERWHELMED IT SOMEHOW. As the summer and the re-opening of the Bluff Creek roads are rapidly approaching, we're just going to give you this piece now as it is, unfinished. It covers the early stages of and introduction to the Project. 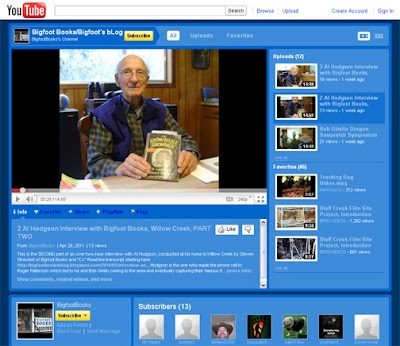 The Bluff Creek Film Site Project's videos may be viewed on the NEW BIGFOOT BOOKS' YouTube Channel, or on the BFRO-Videos account. Go to Bigfoot Books on YouTube! Currently featuring the audio of our Al Hodgson Interview, in progress. walking tour of Willow Creek BIGFOOT iconography and kitsch. As you may have noticed by the two previous posts, we're finally getting all of these Bluff Creek ducks in a row. 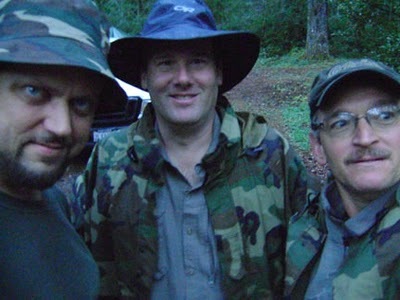 Yes, we admit it, too--we have betrayed you all (a little bit) by leaking information first and generally spending way more time than we'd have liked for a while on the BFF (Bigfoot Forums)... read our posts/threads there: EXPLORING BLUFF CREEK BIGFOOT HISTORY and WHERE IS THE PATTERSON-GIMLIN FILM SITE? (We've posted a lot more extended information up there, so go look into it.) We also got drawn into one of Kitakaze's threads... apologies all around. The good news in all of this is that we have a tremendous amount of unpublished and quite fascinating material coming up for you, and soon, we hope. Bear with us--this post is just the first in a series on what we have investigated and discovered. See our two previous Preliminary Information posts for info. on the background to our Bluff Creek travels. "There can only be one Film Site." Lonesome Ridge, Bluff Creek, centered near the PGF site. During the summer now passed we were up in the Bluff Creek basin many a time. In mid-September and early October we focussed upon locating the exact spot (to the best of our ability) of the Patterson-Gimlin film site. It may come as a surprise to some, but the site is not absolutely established any longer. 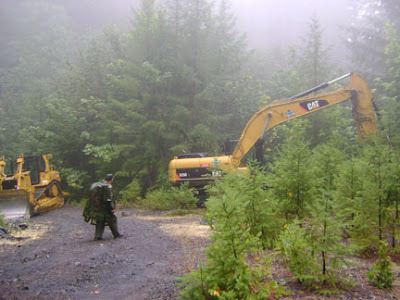 The exact location and track-way WERE once known, and it was repeatedly documented by researchers such as Bob Titmus, Jim McClarin, John Green, Rene Dahinden and Peter Byrne, among others including many locals and those working up there on logging and road building crews. There is no doubt about that, as can be seen in the most notable film site photos from the early days. 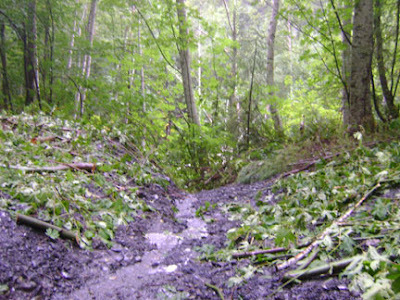 However, in the years since the site was studied most closely, it seems to have been lost to time, buried in dense overgrowth of alders and maples, and at least partially eroded away by landslides and creek flows. We were shocked at first to find out that there were several different locations being pointed to, by the old-time researchers and the internet Google-earthers. We found five different, but mostly very close, locations and a wide array of divergent GPS readings. Not all of them could be true and accurate. Read on, and you will see our process of "rediscovery." So as not to be redundant, we refer you to our many previous blog posts on Bluff Creek and the PGF site--just type those terms into the "Search This Blog" box to the upper left if you're interested. From here in this entry we will assume a certain basic familiarity with the site and the events that happened there. We do NOT question the validity of the PGF and its subject here; we are going on the presumption and evidence, as well as the gut feeling, that it IS REAL. Photos by Steven Streufert, or video captures from Robert Leiterman's video (black borders or with text in image). All others are historical or maps for reference. Perhaps a little personal research history is in order here, briefly. 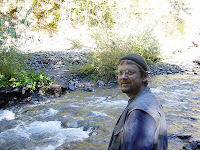 Sometime around the year 2001 we first went camping up in the Bluff Creek basin. Being there at historic Louse Camp brought back the old childhood memories of reading the Bigfoot books at the public library, of having seen the P-G Film sometime around age 10 or 11, and being fascinated with the possibility of such a creature existing. At the time of that trip we had in our possession John Green's On the Track of Sasquatch , and we vaguely decided to try to find the site of the film. Well, it wasn't easy. After trying to hike up the creek we made it maybe a mile and a half, but found only one promising sandbar that didn't seem to come close enough to the mark on Green's map. 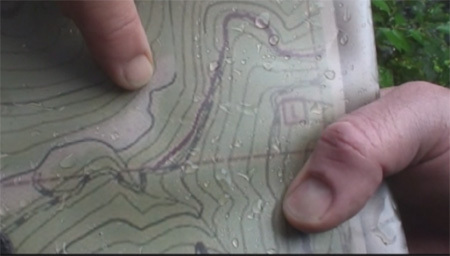 It was all rather vague, as that mark was on a map without a scale close-up enough to see real detail. 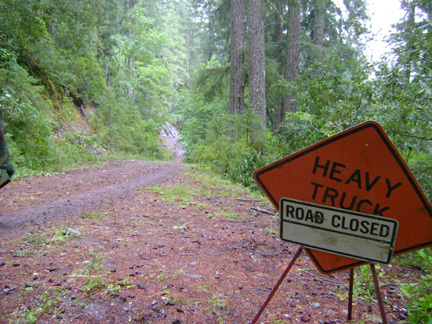 We prowled the old, now-closed forest roads along the west side of the creek. We tried hiking down to the creek, only to find ourselves stuck at huge log piles and near-vertical cliffs. We didn't make it up there after the 2003 Willow Creek International Bigfoot Symposium; but then we were a bit glad we didn't pay the $75.00 to go. The group had gotten there, with luminaries such as Green, Bob Gimlin, Al Hodgson, Daniel Perez, Christopher Murphy, Matt Moneymaker, Autumn Williams, Jim McClarin, and many more; and still they could not all agree on where the site of the exact track-way was. This problematic situation was documented in the Doug Hajicek TV show, Mysterious Encounters.The site had changed so much that those who had been there back in the day could hardly even recognize the general area, let alone the actual site of the sighting and film. We are told that even Bob Gimlin, who was there that day of October 20th, 1967, could not recognize the place at first, and was taking cues from Perez as to its location. 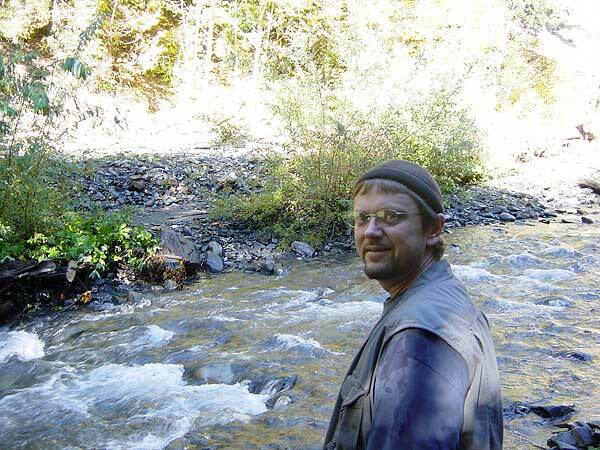 A file photo from 2007, Steve at Bluff Creek. When at last we finally met up with the folks at the 40th Anniversary PGF Celebration, again in Willow Creek, we had been reading more avidly, and had better ideas of where the film site was. Based on advice from James "Bobo" Fay and Cliff Barackman, we headed on down to the site led by Tom Yamarone, with Scott McClean. So there we were, at the bottom of two miles of steep, nasty bushwhack driving, standing down at the creek-level landing, finally at the claimed area of the film site, and then it struck us, looking around at the unfamiliar territory--no one could take us right to the spot and prove it to be the spot. It turrned out that we did make it to the basic area most agree is the right one, but the sense of lingering doubt persisted as we gazed upon a vastly altered and unfamiliar landscape. Nothing looked the same, and no one could give exact directions. Some even think it is downstream, we were told by Yamarone. It became a bit of an obsession with us to discover the truth, especially as it is precisely uncertainties like this regarding the PGF that are exploited by the debunkers as supposed proof of a hoax. In the three years following that conference, we've spent an inordinate amount of time trying to ascertain the history not only of Patterson and Gimlin's time spent in the area, but also the Bigfooting, logging and road-building history of the area. Much of this history seems to be lost to time. Other aspects of it seem vague or contradictory in the memories of many locals who worked up there and many Bigfooters who had been there over the time since the late 1950s when the area became famous for its hairy-hominoidal activities. Though stories were recalled, the exact locations of those events seemed either lost or poorly recalled. This a fact of human memory. So concerned were all involved with viewing the creature in the film, that many neglected to remember the site itself. It was once known well, and was visited and documented regularly by Rene Dahinden, the Swiss-Canadian who perhaps knew the film and its history best. 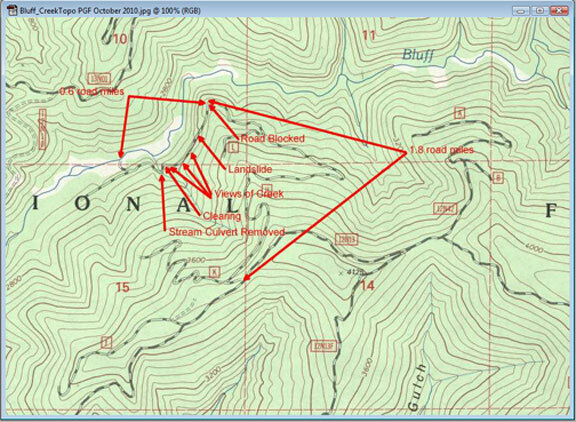 But with the passing of Rene we were left with stories, old photos, an arrow on a topo map in Daniel Perez' Bigfoot at Bluff Creek , but apparently no one who could walk to the site and with absolute confidence put their foot down where Patty had walked. However, many claimed to know, without proof. We are lucky that Dahinden marked the map for Perez, and that Daniel was assiduous enough to preserve and publish it, or we might have lost the site forever. ready to get rained upon. 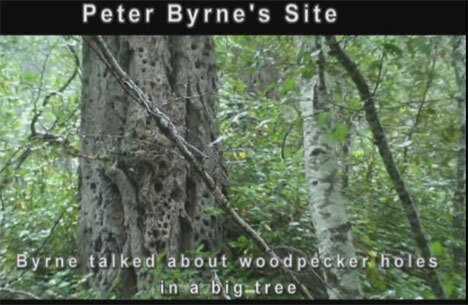 It was frustrating, surely; but studying this history put us in touch with a good portion of the major Bigfoot researchers who were involved with the Bluff Creek site itself, including most of the aforementioned figures and some newer contacts such as Peter Byrne and Jim McClarin. Armed with their statements and advice, we felt prepared to try a series of expeditions to the mysterious creek basin to find out the truth. It was going to take a lot of Sherlocking, however, as we found with our research associate since 2009, "C.I." (name to be kept anonymous), when interviewing Mr. Hodgson and trying to dig the nuggets of certainty we'd need from the Bigfoot literature... it just wasn't there in a complete form. Maps, logging plans, contemporary roads, dates and other pertinent details were obfuscated by time. Various Site Locations, as per various researchers. Sites identified by Steven Streufert via inquiries. Click to Enlarge! The history was fragmented, often conflicted, even sometimes intentionally hidden by certain researchers. Luckily, we got involved with CA State forest ranger Robert Leiterman (BFRO), of Fortuna, CA, who was making field videos for the BFRO YouTube site. A project was conceived between the three of us and, we feel, has nearly been completed. We are on the verge of proving tthings... but the full elaboration of that will have to wait for future installments and an early spring day when the site may be photographed without obscuring deciduous tree leaves. We've made what we think are major and fascinating discoveries and conclusions which we feel are pretty darn close to absolutely proving the true and exact location of the film site and track-way, otherwise cloaked in mystery and disagreement for these many years. struction spots. The spur down stems from FR 12N13. Click to Enlarge. We decided something needed to be done. 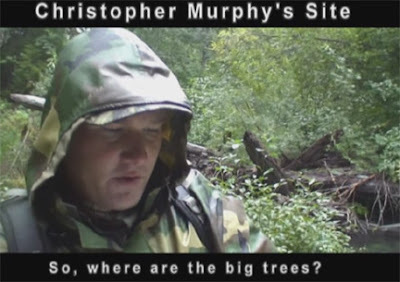 Before all of this was lost to time and fading memory, before all the old-timers were gone, we were determined to find the actual site and rule out the false ones, all while documenting it on video for presentation to the world of Bigfooting. For now, let us recount the first day and some preceding interviews. Part One of our first summer 2010 trip around the area has already been covered in travelogue form with maps and guides HERE, so check that out (there are plenty of links there covering our previous Bluff Creek trips). I'm going to skip part two of that for now in order to get started on this PGF site investigation series. This current entry will cover our second trip, which was partly rained out, but still succeeded in producing many hours of footage to be used in YouTube presentations via the BFRO-Videos page there. See BELOW, where we will present certain supplemental material as APPENDICES. 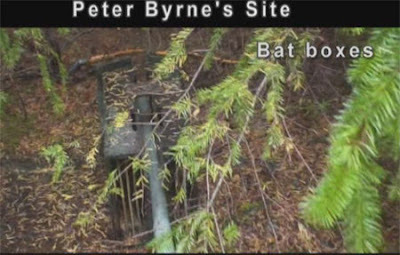 These include conversations with John Green and Peter Byrne, and some of the stuff we posted on the BFF (HERE, if you want to view the whole "Where is the Patterson-Gimlin Film Site" thread). Armed with all the known film site photos, topo maps, and extensive notes and books, C.I and I met in Willow Creek and readied ourselves to set off for the famous Louse Camp to meet Robert Leiterman, who had been up there already for a couple of days preceding us. Of course, right as C.I. arrived in our humble Bigfoot Capital of the World, it stated to rain in a light deluge. Slick, Rene Dahinden, Bob Titmus, etc. 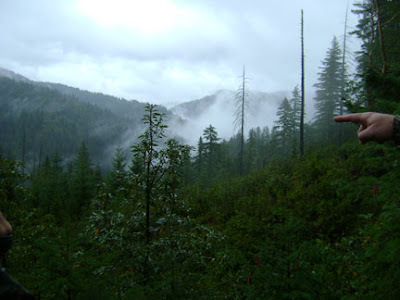 Undaunted, but skeptical of our prospects, we headed up to the hills above the Klamath River. 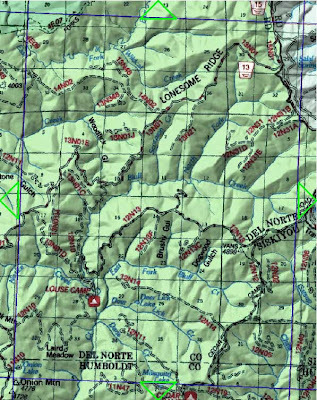 Louse Camp is located right in the heart of the Bluff Creek basin, and is famous for being the location of a myriad of Bigfooting expeditions, including the famous Pacific Northwest Expedition (1959) that had Green, Byrne, Dahinden, Bob Titmus and Tom Slick, it's financial backer, among its members. refreshed by the influx of Notice Creek just above. We were lucky to get up there without being trapped by the kind of meteorological attack from the skies that nearly stranded Patterson and Gimlin back in 1967. The rain became light and sporadic throughout the night. The next day was another matter. Leiterman had just returned from a long, exploratory hike up the creek to the film site area and back. We heard his tales of adventure over a sputtering camp fire. He told of having found the M.K. Davis-identified "film site," downstream some 500 yards from the "bat boxes" landing where nearly all others agree is the real area of the site. He said he found the site implausible on a number of counts, based upon our previous discussions. This aspect will be discussed more thoroughly in State Two of this blog's presentation. Suffice it to say, the MK site is way too wide to fit what is known about the P-G site, and the trees were too far back to be acceptable as the ones in the film. 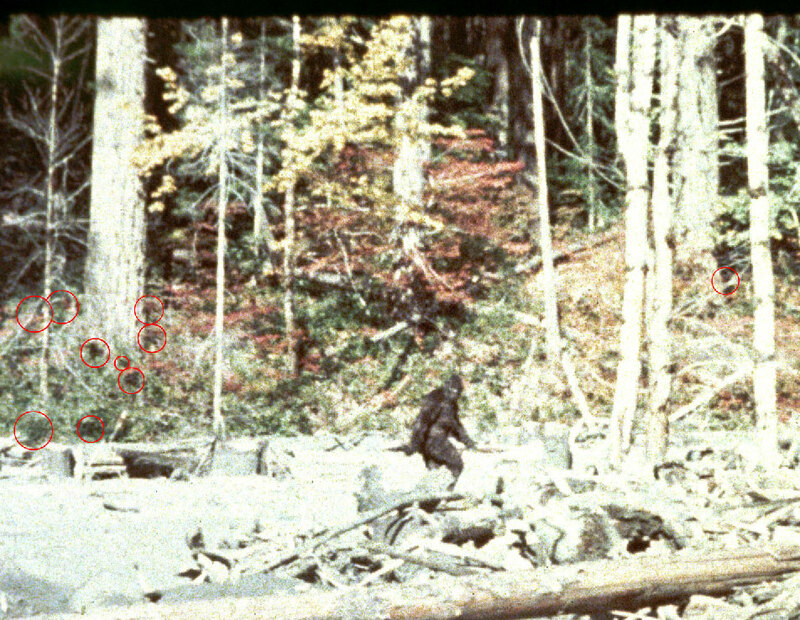 The next day, our first order of business was to try to figure out exactly where Patterson and Gimlin had set up their Bluff Creek base camp before capturing the creature on film. 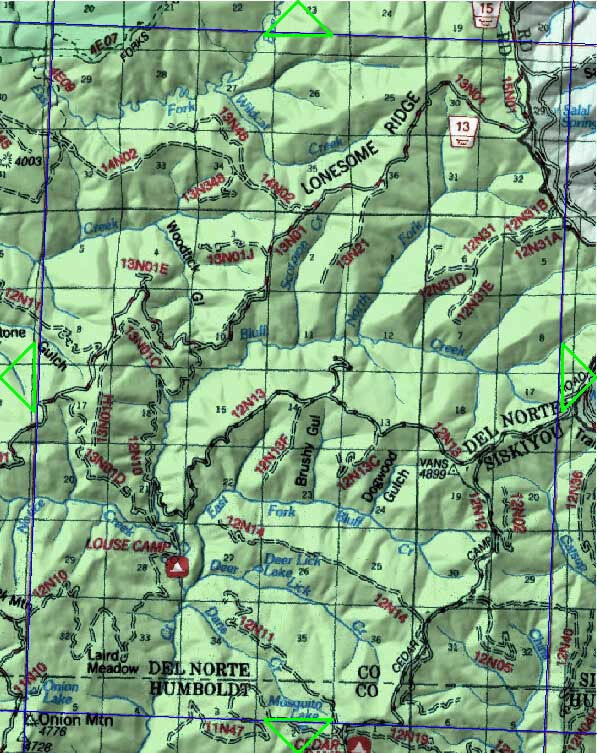 It has been said and rumored for years that they camped "somewhere" above Notice Creek, which flows just up from Louse Camp. Al Hodgson, when asked about this, told CI and I that it was true, and that there was a ford across Bluff Creek, where one could cross and then head up the creek. He also spoke of the bridge over the creek, up from Louse Camp about a mile, which had not been there in 1967. Heading up from Louse we observed that the road quickly ascended up above the creek along the hillside, with radical steep descents down to the creek below. Tracing this idea all the way to the bridge we found the truth: this bridge was the ONLY place after Notice Creek where one could possibly have forded the creek. 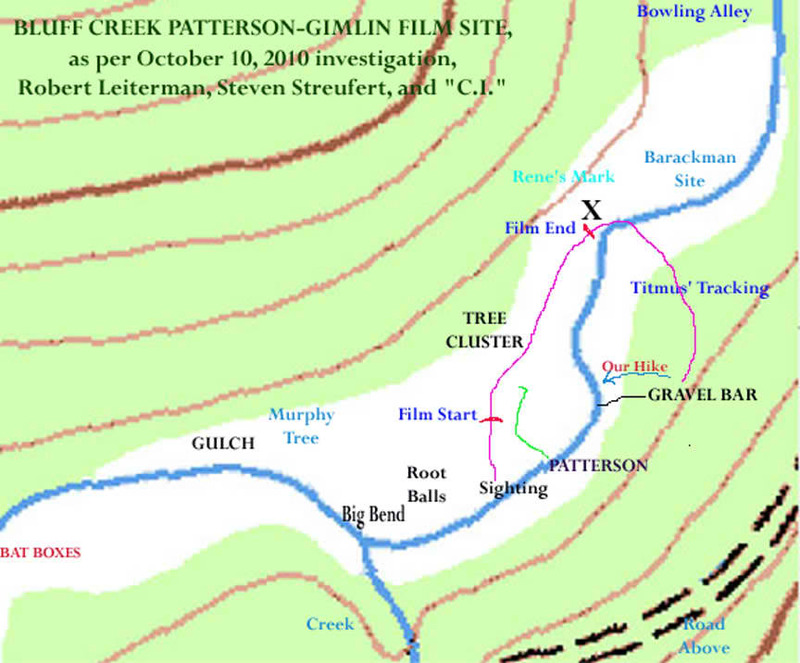 So, Patterson and Gimlin must have forded here, to the east side of the creek, and then headed up the creek to find a suitable camping spot. Indeed, we found clear evidence of the old road cuts under the bridge, on either side of the creek. "Bob Gimlin awoke [on October 20th, the day of the filming] one sunny day in their camp some one half miles or so north of where the bridge ABOVE Notice Creek crosses Bluff Creek." Deciphering that sentence we knew it could not be referring to the Notice Creek Bridge, but rather this one. 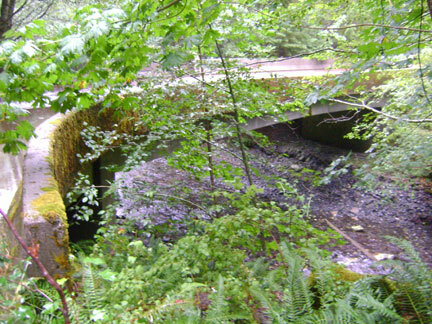 The bridge ON Notice Creek does not CROSS Bluff Creek, but rather Notice Creek. 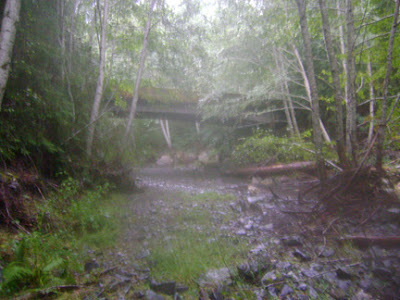 So, we took it that the bridge ABOVE Notice Creek HAD to be the one that is one mile north of Louse Camp. 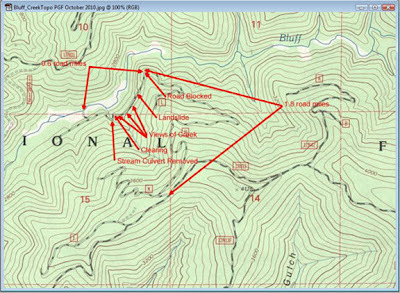 Confirming this, and comparing it with Robert Leiterman's GPS reading from the previous day we found that the half mile up Wasson mentions, combined with the 2.5 miles up from their camp to the film site generally mentioned by Bob Gimlin, made a perfect match with Robert's apprx. 3 mile result. Hence, they could not have camped at the Louse Camp area--that would have made it a nearly 4 mile ride. Under Bluff Creek Bridge, showing old road cut and ford to opposite side. Down under the bridge we could clearly see the old ford's road cuts on either side of the creek, with an old roadbed heading up the east side of the creek, then fording across up a little bit to the west side. Already we knew that the road was just as we suspected: a winding logging access-4WD track that crossed the creek where needed, not the clean road cut up all the way on the east creek side as has been commonly assumed. The bed of the creek is just not wide enough to accommodate the latter, and it often cuts up against steep, hard rock faces. It is shallow enough most of the year, though, to allow for a multitude of needed fords. Again, as Al Hodgson had told us, the old dirt and gravel road had been washed out in the massive 1964 flood, and had then been re-plowed upstream to allow for salvage logging in 1965 and 1966. Despite all of these years gone by, we could still see remnant signs of this road cut, as well as many sawed off tree stumps and root-balls in the creek's course. 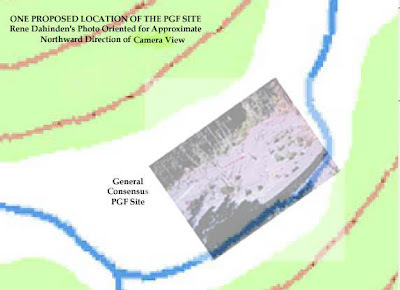 Since 1964 there has not been a comparable flood to alter the major features cut out by the one in 1964, which also constructed the famous PGF sandbar upstream. We noted these results, and planned to investigate up the creek once we had returned from our drive up to the PGF site. Our plan to hike up there this day had been dampened by the rain, now again lightly drizzling down. It was clear to us, however, even at this early point, that we were on the right track to finding the Patterson-Gimlin 1967 base camp. In our Stage Two trip we discovered what is almost certainly the right site. More on that next time, though. from about 2/3 mile up from the site. Warning sign of things to come on 12N13H. Heading up Forest Road 12N13 from the bridge, up to the top of the ridge where it meets with the "H" spur road, we expected an easy ride down the recently cleared, trimmed and graded dirt road. However, the rain gave us concern... that dirt could easily turn to mud. Sure enough, it did. We found that the formerly nicely flat roadbed had been roughed up by tractor trails of some large, heavy equipment. Down the way just over a mile the road got worse and worse until it became a muddy slurry and mess in places. We had to stop, park the truck, and walk on down, a distance we knew would be about a mile through the muck, and a deadly slog back on up, too. Walking down the road, though, provided us with a slow-motion way to view down into the creek basin above the site and from the east heading down. This was, later, to give us the real, best clue we needed to locate the true site. Once a rock slide, always a rock slide. 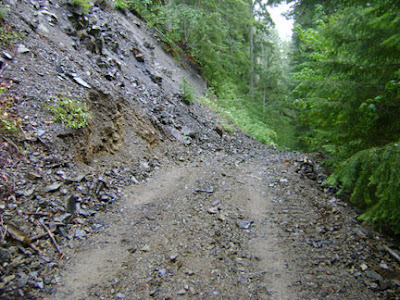 One bit of good news (temporary, see latest developments in State Two) was the plowing through done on the infamous rock slide. This slide has notoriously been the bane of PGF site visitors, especially those without high-clearance four-wheel drive vehicles. Last summer this was the spot of the near-death experience of Craig Woolheater and Sharon Lee (see our previous posts on the Believe-It Tour visit), as their rental van got stuck spinning its wheels after a photo-op and nearly slid off the side into the precipitous near-vertical drop down to the creek. end of the PGF road's line. Now, to die on the P-G film site may seem a glorious way to go, but we assure you no one feels that way as the wheels slip and slide on those jagged Bluff Creek rocks, and the world slips gut-wrenchingly sideways. Anyway, for this one moment, we thought the problem was solved; but as we found out later, the US Forest Service had a decidedly different idea. man upon nature and geology. Down the road a bit we found the culprits of this mayhem--two tractors, a bulldozer and a huge Caterpillar. 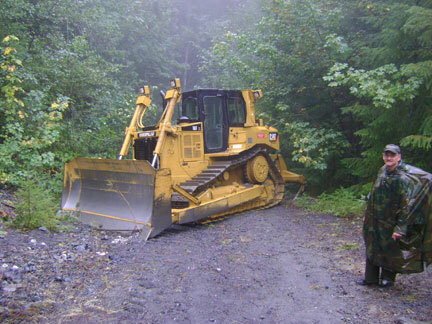 They dozer was actually parked IN the road, blocking it entirely for any prospective intrepid motorists. From here on down it would be on foot for everyone. Down farther, in the formerly marshy bog formed by a culvert-diverted creek that flows down into the film site area's gulch, we found they had torn out the culvert and torn the hell out of the spot.It was not clear to us what they were up to, but it appeared at this time that they were simply upgrading and replacing the culvert. Little did we know! But more on that later, too. is returned to its natural state. After the creek one descends down to the old landing where the "bat boxes" are. This used to be the easy park-and-camp option for PGF site pilgrims--no longer, unless you pack it in. 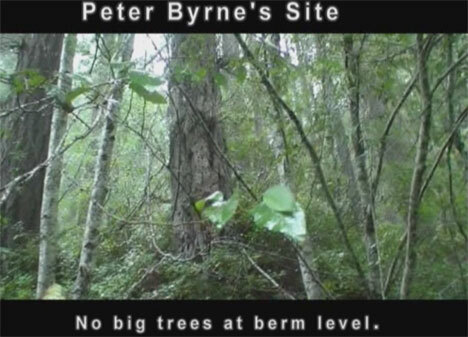 This is where Peter Byrne said to look in my recent email correspondence with him (see Appendix B below for full discourse). The rain increased, saturating us and our gear. You'll note a fogginess enters the photographs here as my camera got wet. Darnit, so did my tobacco. Anyway, here at the bottom we were at our first on our list of prospective film site locations--and it really seemed almost too convenient, here where one could once just get out of the car and gaze at Bigfooting Mecca. houses lay beneath these trees. In preparation for this expedition I had sent out email inquiries to many of the major first generation players in Bigfooting still living. We received a very cordial response from both John Green and Peter Byrne. 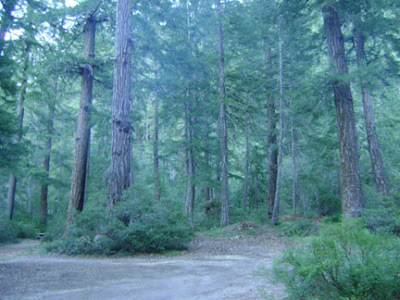 John Green, who said he had only been to the site twice, in 1968 and in 2003, stated that when he was last there he could not even recognize the place, and could not spot the "Big Tree" seen so prominently in the film. So, despite the fact that the place was clearly well known and documented at the time, it was lost to at least one of its major researchers. Hence, we had high hopes in hearing what Mr. Byrne had to say. He'd been there many times, though not as many as the late Rene Dahinden. BFRO-Videos site on YouTube, or through BFRO.net. Laser reading 97-98 yards across south to north, 100 yards in bat box camping area. Trees that match Byrne's distance are way too high up the bank. The creek is on the north side of the sandbar, not the south. Though the area's dimensions match almost enough to the known film site (using a shoe horn to fit it, as C.I. likes to say), the creek and sand bar are in the wrong places, there is no "big bend," no "rootballs," and no level bank or sandbar at all where Byrne indicates. 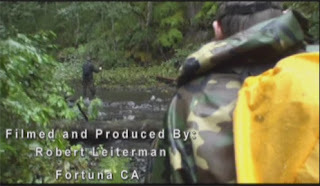 from Robert Leiterman's first edit video results. We found the tree described obviously by Byrne, pockmarked somewhat unusually with woodpecker holes, but it was at most 100 feet, not 100 yards across: too close; and the stumps he described are right next to it, not at the greater distance measured by Dahinden. 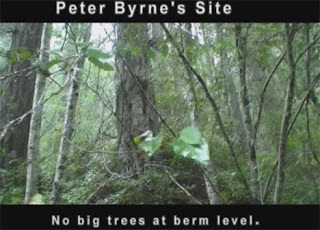 To reach up to the larger trees on the hill above the creek and sandbar would have had to have been some 30 or 40 feet higher--just not plausible, and exceeding the already high level of subsidence mentioned by Byrne in his email. 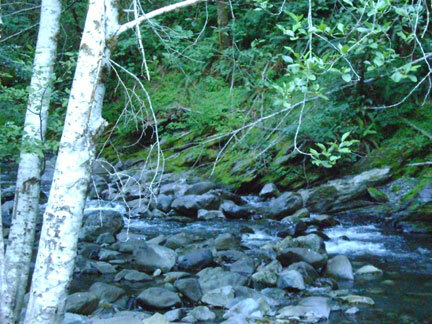 The creek is in an old, established bed, at the lowest point of flow, and there is no indication of any major event that could have changed this geological fact. The 300 feet or so needed to fit the film site in is here, but the creek would have had to have flowed way up against the south edge of the bat boxes landing, an area that is significantly raised up from where the creek is flowing. 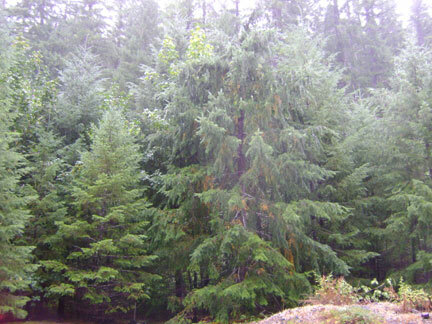 The site is still too narrow, if we assume that the big tree here is one of the ones in the film. The creature would have had to start its walk down in the narrow gulch seen to the left. There is no "big bend" in the creek below that site either. 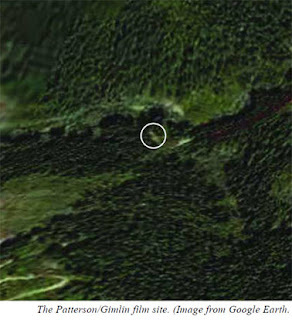 In fact, the bend with rootballs is seen ABOVE the site located in Murphy's book, followed by a straight line in the creek headed west and downstream. work the first sighting would have to have been in here. 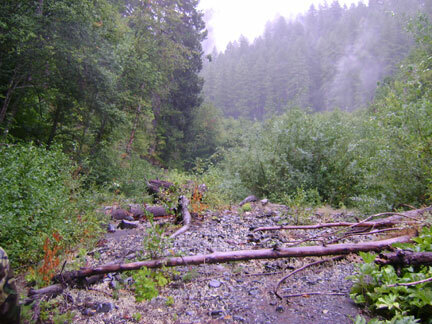 In this narrow part of the creek there ARE a lot of big old firs that have fallen down across the creek due to erosion and rock slides on the north bank. However, if these were the trees in the film, as proposed by the Murphy site location, they are simply too close to the creek to allow for the big sand bar seen in the PGF. Also, there is no logical way the creek could have flowed some 200 feet or so to the south, as that direction features and upgrade and the start of some low hills. A creek cannot flow up on a higher course if there is an unobstructed lower course it can access. 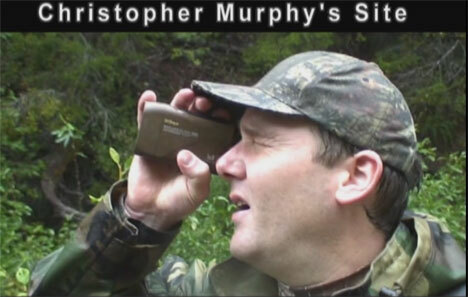 of the proposed Christopher Murphy film site location. Laser readings 55 yards from creek to back trees, some 60 yards to the trees on the south bank. 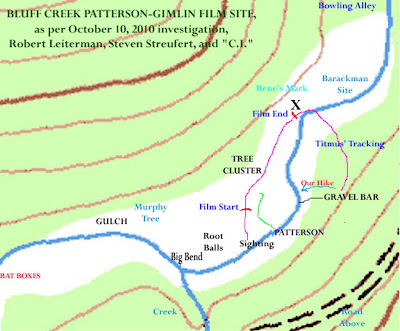 Again, this site fits "with a shoehorn," but the creek is way too far to the north, and there is no room at all for any of the known features of the old sandbar, the big bend or the root balls described by Gimlin. The big trees identified with this site are high up on the bank at least 20 feet up the hill--way too high, even allowing for sandbar subsidence. Most crucially, there is no hill going up high enough on the south bank, and yet close enough to the site, to allow for the angle of view seen in the 1971 Rene Dahinden photo which we used constantly for comparison on these trips. actual fact, this is WAY off from Dahinden's mark. There IS one big tree behind this spot, as can be seen on this blog (picture link HERE), but this tree is way too close to the fairly narrow sand bar at the bottom of the big bend that centers around a small feeder creek that flows down into Bluff at this point. It sits down on the sand bar near the current creek's bank, but there just isn't enough room to place this as the main "big tree" in the film. This spot, by the way, is where the National Geographic filming team landed their helicopter in 2009 to film and scan the site. Unfortunately, it doesn't appear to be the right location, and we tried to tell them that when we were down there then, to no avail. On this year's trip we even found their flagging tape wrapped around a rock, still there right in the creekbed, despite a whole winter's raised water. Christopher Murphy's exploration of the film site he proposes, done in 2003, can be looked at here on Hancock House's site: FILM SITE ALBUM. We challenge you to compare his analysis, based on one visit, with the results we have come up with after some dozen visits. 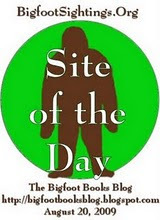 See our videos on the BFROVideos site under "Uploads," as well as on THE BIGFOOT BOOKS YOUTUBE PAGE, under "Favorites." Watch for upcoming presentations to be done on this blog. "To Be Continued, Indeedy." Byrne's, but it lacks landmarks and proper orientation. 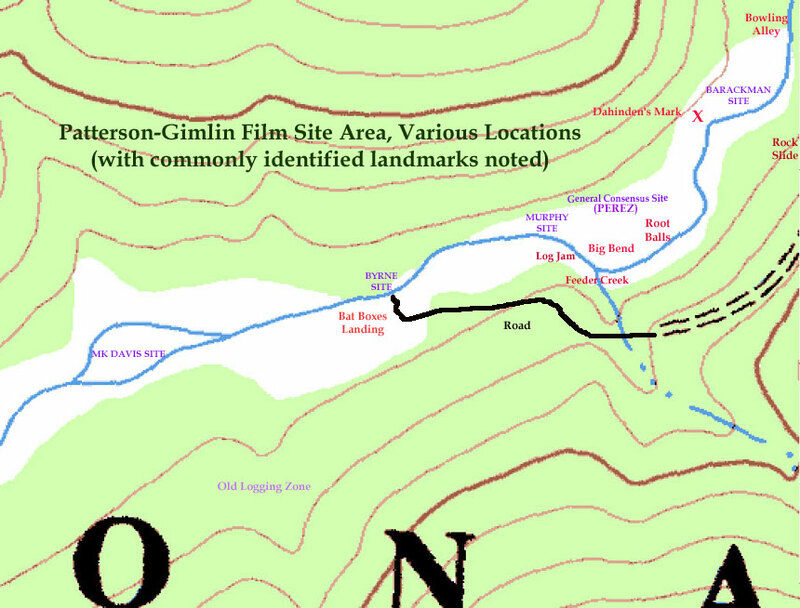 below the site, as Gimlin describes. No big trees in back either. Murphy site, for sure. Photo capture from Leiterman video. Leiterman, from his upcoming video release on our trip. Good talking with you on the phone yesterday. Thanks for getting back to me so soon. 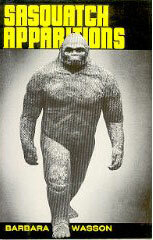 As you already know, I have been a subscriber to Bigfoot Times for several years now. My latest video project is on the Patterson/Gimlin Film Site entitled … Journey of Re-discovery- The Bluff Creek Film Site Project. I’ve been working mostly with Steven Streufert from Bigfoot Books (Willow Creek) and Ian from Northern CA over these last few months. Our group’s motivations might be different but our goals are similar, relocating the film site 43 years later despite the environmental changes. You have worked painstakingly hard over the last few years dealing with the film site subject matter. 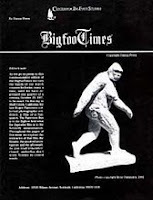 Your Bigfoot Times at Bluff Creek (1992) publication is excellent work, placing your self into a knowledgeable position on the subject. Despite your dedication and documentation there are a hand full of others, for whatever reasons, who still insist that the film site is either located above or below the area in which you have painstakingly established. I understand why you feel the way you do when you hear the echoes of doubt from a small minority vocalizing across the internet. I also realize that dumping even more documentation into their laps may not change their opinions either. With that said, the project I have taken on is a rediscover for my self, a journey for understanding. With the help of Steve and Ian, I’m video documenting the process. 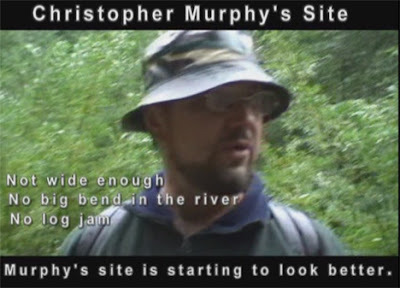 I feel the video footage will allow others with an interest in the subject, to join in with a discovery of their own. As you know, there can only be one film site. While looking over the literature, interviewing those who were there, and examining what remains of the scene, we are looking forward to the outcome. The several days I have already spent with hunger and fatigue in the heat and rain: following what is left of the Bluff Creek Trail up the creek, pondering campsites, crisscrossing the alleged film site locations looking for the big trees, locations of old stumps, gravel bars (existing or not), deposits of alluvial sand, bends in the creek, woody debris, large root balls, and matching historic photos, has been an adventure in itself. And yes, I’m fully aware that 43 years have worked their magic. While I’m at it, I’m developing a better understanding of the historic event and the surrounding topography. I only wish I had started this journey years earlier. Despite all of my effort, some say I’m wasting my time, that the answers may never be found, erased forever by time, that there is nothing more to learn from rediscovering that moment. I disagree. Putting your self right there in the thick of it does something to you. To walk through the cool clear water, to hear the echoes in the creek canyon, to go back in time, to grab a hand full of alluvial sand and tell your partner … “Patty walked here!” To watch them grin ear to ear and nod their heads in agreement as they look curiously over their shoulders. And before you know it, you’ve taken one more step closer to imagining how Patterson and Gimlin must have felt that autumn day. For me, the bottom of the dark, forested canyon still has meaning. 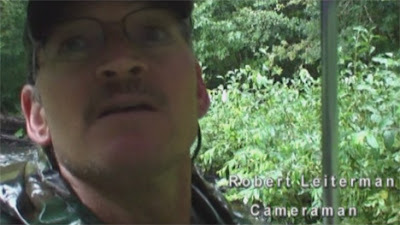 "Watch for Robert’s soon to be uploaded Journey of Re-discovery- The Bluff Creek Film Site Project and his other video projects on the B.F.R.O.’s (Bigfoot Field Research Organization) video channel." major proposed site locations and landmarks. One Proposed Location. Photo aligned to creek, not quite to scale. just about perfect as a match for the "aerial" Dahinden photo. The first sighting would be just to left of the photo border. Me so very happy you hu-man looking in wrong creek for me! Like NABS Dave say, you not find me there anytime more. You look in Hoopa, you find me. That right! Me hang at Golden Bear Casino ever night, and you not know! JHa Ha Ho Ho! They have good food all night, and not ever question how furry me are, not how stinky, so long as me have token for machine. See? Dave right after all!!! 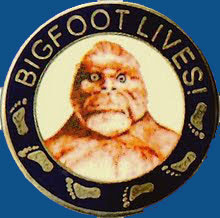 Steve, I'm just curious if you or any of your fellow explorers had any kind of Bigfoot "encounter" activity around the Bluff Creek site? 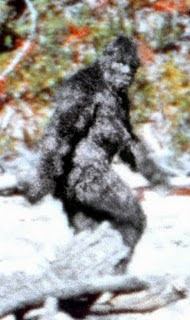 Yes, there HAVE been recent reports of Bigfoot activity in Bluff Creek. However, NO, we did not see one (yet) while up there. I personally know people who have seen them there.